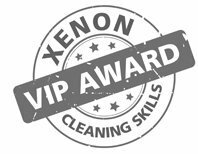 Xenon expects a great deal from our staff in terms of their personal presentation and professionalism, largely because of the importance we place on training to give them the confidence to perform to the standards we set. When they join the company, cleaning personnel undergo a full induction training assessment which includes fire precaution and health & safety training. They are then taken through relevant training in excess of BICS standards and on-site training before starting work with a new client. Xenon has developed its own training regime which provides a consistent and methodical framework to ensure that our workforce has unified approach and performs to our high company standards. Our Cleaning Skills Workshop takes staff through detailed procedures for seven specific skill sets and is backed by a 90-page manual. No one is placed on site without thorough induction and onsite training or before we are confident they are competent to carry out their skill sets. Once staff have completed the workshop, they are part of our programme of recognition and reward and are able to earn certificates, awards and VIP badges – the latter being a mark of excellence to wear proudly on their uniforms whilst at work. Training does not end with induction, we run continuous in-house and on-site training to give operatives ongoing support, specific knowledge and expert skills.